Buy The Rebel & The King on Amazon here. Hello to all the Elvis fans from all over the world! 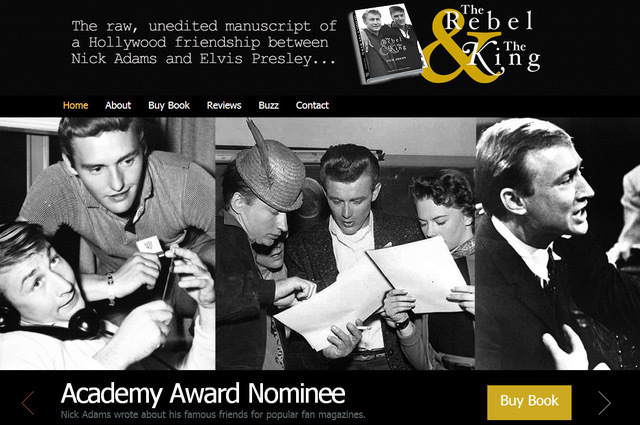 This Elvis and Nick journey began when I published The Rebel and the King by Nick Adams. I found the manuscript in a box that I had been carrying around for 45 years, since my Dad died when I was seven. Finding those worn pages changed my life because I got to know my father during his early Hollywood heyday, as a young, struggling actor, and his friendship with the rising singer, Elvis Presley. You can pick up your copy of The Rebel and the King (Expanded Version) on Amazon here “The Rebel and the King by Nick Adams” and read all about Elvis and Nick’s eight days in Memphis during the famous singer’s Tupelo Homecoming Concert of September 26, 1956. Feel free to write a review of the book and let me know how you like it! Thank you to everybody who keeps making this journey an adventure. Most of all, here’s to The King Elvis! Los Angeles Times- Actor in the Kings Court by Susan King. Watch a short video by Roy Turner about my trip to Graceland and Tupelo, with never before seen photos of Elvis Presley, Nick Adams and Natalie Wood. Make sure you check out the cool photo gallery and articles about The Rebel and the King. Enjoy the ride! Special thanks to Roy Turner and Maria Sanderson!